This page is new--and as you can see, just beginning. What I have in mind is a page to communicate with some distant customers who have unique guitars on order, and a way to tell about ideas and projects which currently have me excited. These may be new guitars or tools which I am building or tools I have bought (remember--I am a certified tool nut and there is hardly a tool I won't buy and love.) Stay Tuned. The most unusual project which I currently have going is a harp guitar patterned after an old Dyer Brothers Harp Guitar. I have seen a number of these as repair projects over the years, and have always loved them -- partly because I have an affinity for the strange and eccentric, and partly because they have a unique and wonderful sound. Years ago I had a customer who played one regularly as part of his act--he was a bit of a minstrel. I also have a customer who collects them -- he has them in both a guitar size but also in a mandolin and mandola size. A few months ago I received an e-mail asking if I would consider building a harp guitar. After a flurry of e-mails and a visit to the shop, the deal was struck. This will be a mahogany body and spruce top. (Actually, my plan is to build two -- one with a sitka spruce top and one with an Engleman spruce top) I am still working out the design features and have the wood in hand -- which is no small thing since the instrument is very oversize. Next, I will refine the drawing and begin the mold in which I will build it. Hopefully at the same time I can begin to cut the wood, join it, and add the rosettes, all prior to sanding. As I progress I will be adding photos and further reports. The photos and weekly reports are on a separate page -- I am trying to keep download times to less than infinite. One of the great difficulties for guitar makers, both logistically and financially, and perhaps even more, emotionally, is that much of our materials are endangered or rainforest woods. Many guitar makers have begun to experiment with alternative and sustainable woods (for example, the famous Taylor pallet guitar). Up to this date I have not done this--partly because my production was low, and partly due to inertia. About a month ago I received an advertisement from a supplier of walnut, which showed some absolutely gorgeous wood, and I began to think about buying some. About a week later, I get an E-Mail from a Minneapolis resident who expressed an interest in a walnut guitar -- talk about serendipity. So, I have bought the wood and am embarking on the construction of two guitars with beautiful curly walnut. Again, I will keep a running progress report. The photos and descriptions are on a separate page. We recently bought a very badly deteriorated Martin 0-17 which was built in 1908. We have decided to do a full restoration of this instrument, and to document the project on the web site. This is a long term project, so don't expect any immediate gratification. However, the "Before" photos are posted, as is a discussion of the decisions we will have to make before beginning the project. It recently occurred to me that some of the photos and information that I have included in the descriptions of the harp guitar and the walnut guitars would amount to a description of how I build all of my guitars -- so I thought I would make a page about building guitars -- from start to finish. By selectively linking to other pages on this site, and adding other new information, I will eventually have the whole process illustrated. This is just beginning, but I hope that it will be interesting to visitors to this site. has a slotted head. Until Waverly came out with good gears for steel string slotted heads, I have never felt that I could build what I wanted in a slotted head. I had very high hopes for this guitar while I was building it, and am very happy with the end result. It has the balance I expect from a concert sized guitar with the richness and sweetness of tone I hoped for from the twelve fret neck. (I believe that this is largely a function of moving the location of the bridge in the top). On top of all this, it is very loud. All in all, a very satisfying guitar. I have recently finished a rather unique guitar, built at the request of one of my most loyal customers. It is a 3/4 size guitar (23" scale) made of mahogany, with a mahogany top. 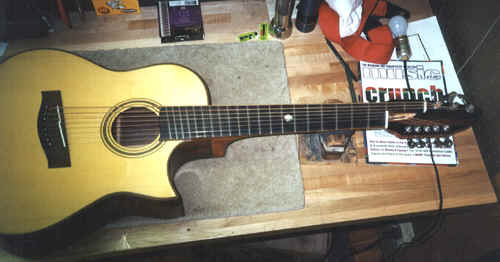 It was built with a cutaway and a 24 fret fingerboard, and is tuned high (first string is tuned to an A). All in all a very wonderful instrument for a special purpose. This is a rather unique guitar which my son made. As you can see, it has 8 strings. Five are normal, and the other three are bass strings, and have a longer scale. In addition it has a Novax Fan Fret Fingerboarrd. It will take a while to figure out exactly what the possibilities are. Leo Kottke was in a week or so ago and played it, and even he was a bit perplexed! !